* LIFETIME WARRANTY! Innovative Bold Styling: The all new UPR Blu Thunder TR-3650 Shifter replaces the weak stock shifter rail assembly in your 2005-2009 Ford Mustang GT. 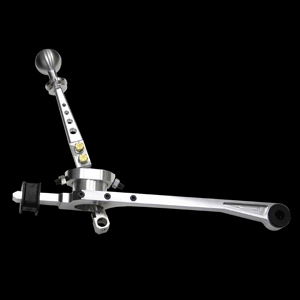 Designed to improve upon the stock sloppy shifter in every way possible and provide positive shifter stops to prevent damage to the transmission under hard shifting. Constructed of billet aluminum and stainless steel, the UPR shifter has a lifetime warranty unparalleled in the industry. Included in our Blu Thunder shifter one of our Billet Shift handles and Billet Shift Knobs for a complete package ready to bolt in and go. Quality Construction: The main beam was made from CNC Machined Billet Aluminum and fitted with Energy Suspension body and transmission side bushings to create a solid link and eliminate the weak stock unit and flexible factory rubber bushings. Next it was fitted with our teflon lined bearing for a smooth operation. The shifter crown was machined and fitted with hardware for shifter stops allowing the user the ability to set shifter stops to prevent overshifting and damaging the transmission under hard shifting. Taking our experience with our other Blu Thunder shifters we made the shifter shaft out of Stainless Steel to ensure the strongest material was used where it counts. To finish it off we include one of our Billet Aluminum Shifter Handles and Billet Shifter Knobs. No one else gives you the bold clean styling of our Aftermarket Dress Ups, Suspension and Performance Parts for your American Muscle Car like UPR Products! Installs in 60 minutes or less. Click Here for Instructions Fits these Vehicles: 2005 2006 2007 2008 2009 V8 GT Bullitt Mustang Roush & Saleen Vehicles. Proudly Made in the USA!